Classroom blocks are the ideal way for schools to expand or to serve as new, inspiring spaces for pupils to learn with. Easier to build and more cost effective than brick and mortar buildings as well as being far more durable and eco-friendly than most temporary solutions, classroom blocks can provide a school with an innovative and ecological alternative to traditional expansions and building projects. 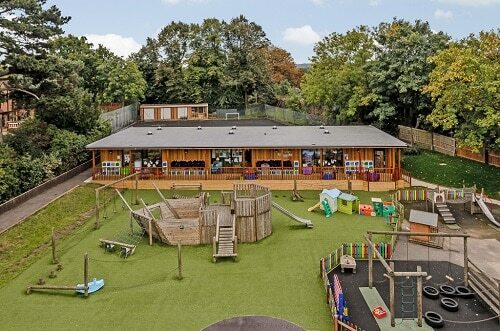 Being able to incorporate may different features and functions, our eco-classroom blocks can be adapted and expanded upon due to their modular building process. The classroom blocks are also designed to be built with sustainable materials and high energy efficiency levels, increasing their durability and eco benefits even further. A returning customer of TG Escapes, Bickley Park School needed additional space for the growing number of pupils attending the school from the local area. The school wanted a large classroom block which could be used to teach the older years of the school and to provide an inspiring environment for them to learn within. Located near fields and trees at the rear of the school, it was important for Bickley Park to have a building which blended into the natural environment whilst at the same time being large enough to accommodate a number of different classrooms. We provided this space with the building of a eco-classroom block, using large panelled glass windows to allow natural light within the classrooms and building a covered deck which promoted free flow between the classrooms. 200-300m² classroom blocks are perfect buildings to accommodate classrooms with several functions and facilities. From music rooms to generic classroom spaces, there is sufficient space for three normal standard sized classrooms or several smaller ones.